As a beginning teacher, I count myself very fortunate to have been posted to Edgefield Secondary School fresh out of my teacher qualification training at the National Institute of Education. In the short year and a half that I have been here, I have learned a great deal from my colleagues and students whom I have had the privilege of interacting with. The staff here at Edgefield Secondary School live out the ethos of the teaching profession. I am constantly awed by the high standards my colleagues set for themselves and the many sacrifices they willing make for the sake of the students. It is not uncommon for teachers to spend their pockets of free time chatting with students to ensure that they have the best learning environments in school or painstakingly curating the best resources to create a thoughtful lesson for students. Through their guidance, I have come to better appreciate the hard work that goes into the heart of teaching. I am inspired daily to also give my best for my own students and rest in the assurance and confidence that we are all working towards the same goal of educating our future leaders. My wife and I welcomed our 2nd child in my first year in this school. Amidst all the bustle of my duties as a Dad, I managed to fulfil my many other responsibilities as a teacher too. I was given a lot of space to pursue my interests and contribute meaningfully to the school. I found many like- minded colleagues who shared the same passions and formed positive synergies which allowed us to value add the school experience both for teachers and students. Year by year, the school has been gaining momentum in our programs and it is heartwarming to see students really step up and do the school proud. With timely support from the school management and backed by an efficient school admin team, I really feel energised thinking and planning for the year to come. As I watch my own children grow I am happy to be part of the growing Edgefield community. Today we see more and more of our alumni coming back eager to serve and through the Uniformed Groups we are working on platforms for them to develop unique identities and cultures within the various CCAs. It is refreshing to be part of a “young school” which is vibrant and forward thinking. As I reflect on my journey at Edgefield thus far, the one experience that flashed in my mind was when I attended the Apple training in Orchard, as part of our Humanities department meeting. We were treated to a hands-on session on the ‘Procreate’ software. I was engaged throughout the three hours that we spent there, lost in a new world of dimension, space, and perspective. The experience connected me to a time way back in the past when Art was a leisurely activity I occasionally indulged in but was intercepted along the way as ‘life’ took precedence. It made me realise that all is not lost. There is time yet to develop my hitherto unexplored potential. At this juncture, though, allow me to emphasise that the word indulgence does not necessarily equate with proficiency. Needless to say, it was a Humanities meeting like no other. I left the place in high spirits, with my mind opened to new possibilities. I hope that Edgefield can create more of such experiences to enable us not just to bond with fellow colleagues, but also to learn new skills that we would ordinarily not have the time to do so on our own. For more details, please click here . I think the great thing I really appreciate is having the opportunity to engage with my kids while they are in school. There are many chances to do things outside the school with our children, but it is quite different to stay in touch them during their teenage years. It is a good way to retain the bond we have with them and also to strengthen that bond. As they go through their own set of challenges during their Secondary school years, I count myself lucky to be able to have this rare opportunity to keep in close touch with my son. My son, Ryan Iskandar Tunstall (1EM, 2018), is also happy to have his daddy at school, joining in various events and activities in Edgefield Secondary. While there are other parents’ children that are embarrassed when their parents are around, I am grateful that my children do not feel this way. My wife and I have been involved in our children’s lives and have done this all the way through their schoolings years from Primary School. 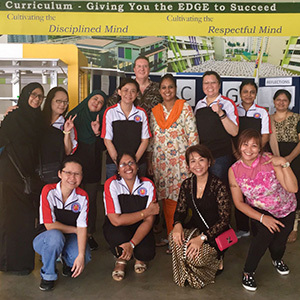 Our two girls are currently at Seng Kang Primary School and it is definitely a stark change, as there are not as many activities in Secondary Schools. This is why Mr Eric Foo (HOD /PE & CCA), Mr Shawn Lye, and I are trying to boost the ‘Dads for Life’ programme as much as we can. We are trying to bring it back to life as we work through the challenges of doing so! Truly, the people who benefit the most are my children and myself. Many parents don’t know what they are missing. This opportunity to bond with your child only comes once. My own parents never had the opportunity or time. I hope more parents will take this wonderful opportunity up for themselves in the future! Working with Edgefield in the last couple of years has surely been a positive experience thus far. Just this year in the first half of the year, we had a few major collaborations which were highly successful. In the midst of the Chinese New Year celebrations, Edgefield students took time out of the usual festivities to give back to the community on the 24th of February. Led by HOD/MT, Mdm Genevieve Tan, the team visited various needy families in Punggol West and distributed close to 80 hampers. The team spent about 3 to 4 hours working hand in hand with a group of ACTIVE AGEING senior volunteers from Punggol West to give out these hampers. The students who were involved had a good time interacting and relating to the ACTIVE AGEING Senior volunteers and gaining knowledge and insights on life from them. It was indeed a meaningful time spent together! We also had two other events that happened on the 10th of March this year. The first was the NORTH-EAST CDC ELDERSURF INTERGEN BOOT CAMP SMARTPHONE WORKSHOP. This collaboration was initiated because the elderly possessed smartphones which they were unfamiliar with and did not know how to manoeuvre effectively. Because of this, the need for them to be taught, helped, and guided arose. The Punggol West ACTIVE AGEING community (under Punggol West Division) partnered up with Edgefield, and ran the ELDERSURF SMART WORKSHOP. Students had to learn to teach elders how to use smart phones and enable them to be more competent in handling smart phones. As much as it was a learning experience for the senior citizens, it was just as much a learning curve for the students as they learnt how to be patience and skilful in passing on knowledge that is second-nature to them. 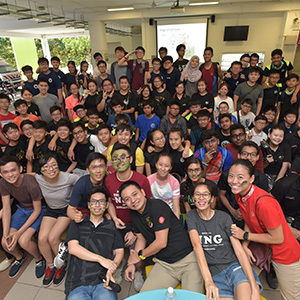 On the same day, the PUNGGOL WEST CC YOUTH EXECUTIVE COMMITTEE was set up where some youths took part in a swearing-in ceremony for the formation of their committee followed by a game of Laser Tag where Pasir Ris-Punggol Grassroots Adviser, Ms Sun Xueling, graced the event. Joining her as part of the witnesses, was a group of Edgefield students, who also took part in the Laser Tag event. It surely was a blast for all youths involved! 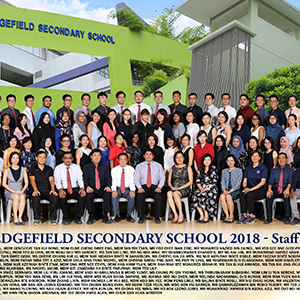 All in all, it’s been a very fruitful partnership with Edgefield Secondary in recent years, and it’s been a joy liaising with Mr Eric Foo, HOD/PE&CCA and HOD/MT, Mdm Genevieve Tan. I look forward to more collaborations in the future that would make experiences meaningful for both Punggol West Division volunteers as well as Edgefield students alike.